Plain Township Fire Department participates in automatic response agreements with surrounding departments. In the late 1980’s, Plain Township officials realized that their fire station, built in 1945 was having difficulty keeping up with the increasing needs of the Plain Township community. The Township Board of Trustees adopted a resolution in February of 1994 to place a .85-mil bond issue before the community. Thanks to the support of the community construction began in October of 1996 and was completed in August of 1997 for the current Plain Township Fire Department located at 9500 Johnstown Road. The fire station is designed to house 12 fire fighters per shift per day, administrative offices, records, training facilities, and apparatus. The Plain Township Fire Department services the City of New Albany and the surrounding township. Services are provided to the MORPC estimated 9,829 village and township residents, in addition to the business and school campuses. The New Albany School system serves about 4,325 students. There are approximately 300 + businesses and an estimated 12,000 employees commuting into the business park daily. The area of the township is about 20 Square miles. In addition to the increased population growth associated with the residential and commercial construction the department must address the size of residential structures and plan for staffing, tactics and equipment in a proactive approach. In other communities the average new home is 2,000-3,000 square feet. However, in New Albany, a large number of homes are over 5,000 square feet and some as large as 10,000 square feet. The department must also address the increased number of community events offered and the large number of patrons that attend. Since 2000, the EMS runs have increased 87% and the Fire/Rescue runs have increased 40%. The City of Columbus provides water and sanitary services to the City of New Albany. The City of New Albany’s 1000 plus fire hydrants are inspected and operated twice a year by Plain Township Firefighters. When temperatures go below freezing they are checked monthly. Most of the unincorporated areas of the Township are non-hydrant districts. Under the new annexation law a portion of Plain Township has been incorporated in the City of Columbus. That area will receive fire protection from both Columbus and Plain Township. Dispatching services for fire and EMS are dispatched through the Metropolitan Emergency Communications Center for Mifflin Township, Jefferson Township, Plain Township, Violet Township, Truro Township, the City of Whitehall and the State Fire Marshal’s Investigations Bureau. The daily staffing of the fire department averages 11 fulltime firefighter/paramedics cross- staffing an engine, ladder, medics and a command vehicle. The Plain Township Fire Department continues to utilize the department’s master plan to strategically meet the needs of a growing community. The people of Plain Township and New Albany have given their support over the years by approving operating levies as they were placed on the ballots. Hundreds of citizens have served as volunteer firefighters since our beginning in 1943. It would not be possible to name them all, but we sincerely thank each and every one of them for their service and the constant community support. Construction for Station 121 began in October of 1996 and was completed in August of 1997. The Plain Township Fire Department is located at 9500 Johnstown Road. The fire station is designed to house 12 fire fighters per 24-hour shift, administrative offices, records, training facilities, and apparatus. The station also features a Decon room andseparate laundry facilities for daily uniforms and fire gear maintenance. Each on duty firefighter is assigned an individual bunk room. The Plain Township Fire Department provides Fire and EMS emergency services to Plain Township and the City of New Albany. 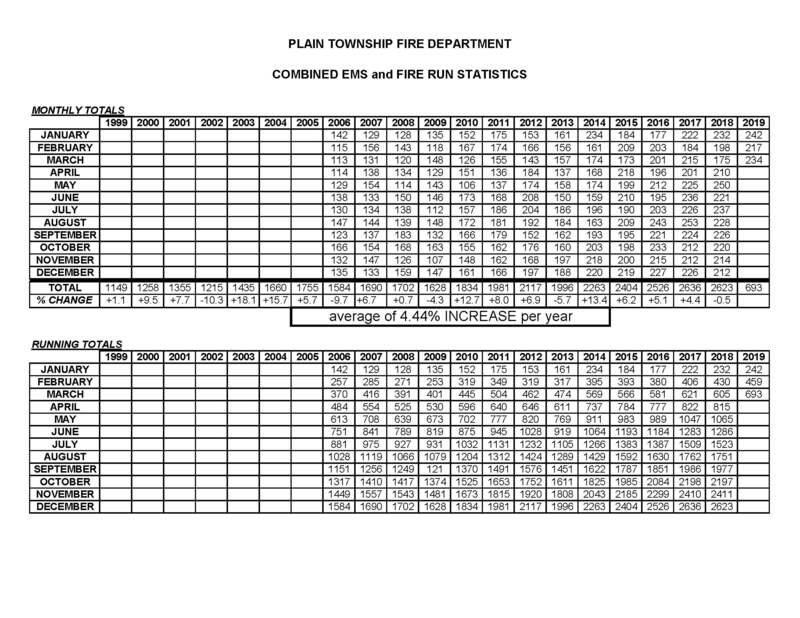 Since 2006, the department's combined Fire and EMS runs have continued to increase an average of 4.44% per year. In 2018, The Plain Township Fire Department provided service for 2,623 emergency service runs, 916 fire runs and 1696 EMS runs. Click for PDF of run statistics. Chief John Hoovler started his fire career as a volunteer firefighter with Johnstown Fire Department in 1974. He became a paramedic in 1978 and continued to volunteer until he was hired as Johnstown’s first fulltime firefighter in 1987. John has progressed through each position in the fire service including, firefighter/paramedic, Lieutenant, Captain, Assistant Chief and Chief. 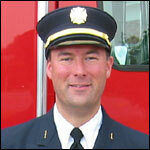 In 1993 John took a part-time position at Worthington Fire Department as a firefighter/paramedic. John was hired in 1994, by Madison Township as a fulltime firefighter/paramedic and continued to work part-time at Worthington. Oct 1994 he was sworn in as Fire Chief of the Plain Township Fire Department. He is married to his wife Kathleen and they have four daughters with eight grandchildren, and two great grandchildren. In his spare time he enjoys farming and raising beef cattle and occasionally going camping. Assistant Chief Rupp has over 30 years of fire service experience. Serving Madison Township in Franklin County for over 27 years. During that time he served as a Firefighter / Paramedic, EMS Officer, Company Officer, Battalion Commander and Executive Officer. In 2002, the Plain Township Board of Trustees approved hiring him into the Assistant Fire Chief position. Asst. Chief Rupp currently oversees operations, training, fire prevention and EMS billing. He assists the Fire Chief with human resource management, planning and budgeting. He chairs the operations board for the Metropolitan Emergency Communications Center (MECC) and is on the advisory group for the Central Ohio Strike Team (Ohio Region 4 USAR). 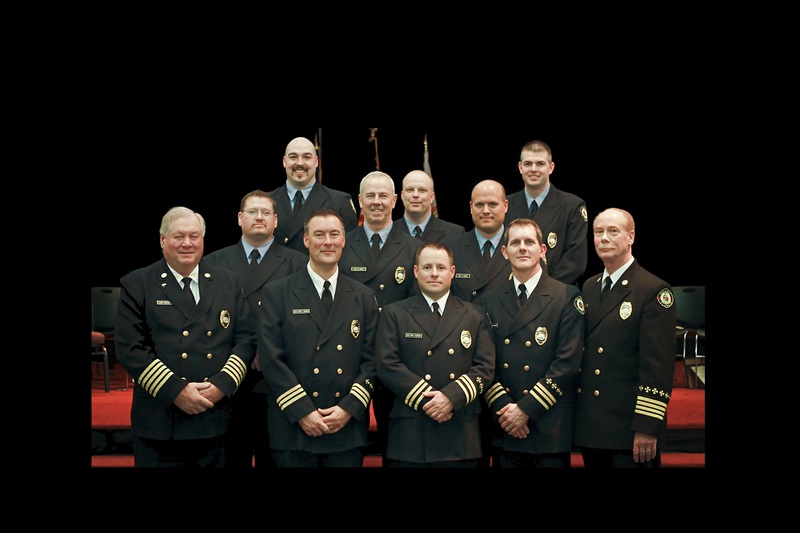 Chief Rupp is a member of the Ohio Fire Chief’s Association and serves on a number of state committees. In addition Chief Rupp has served on the Ohio EMS Board and is a founding Board Member for the FCFF / Grant Medical Center Paramedic Program and still serves on that Advisory Board. Asst. Chief Rupp's educational background includes both formal and technical training. He is a certified paramedic, public safety instructor, fire safety inspector and hazmat technician. He and his wife Carol, have three sons and a daughter. All three sons have chosen careers in the fire service. Battalion Chief Kevin Sponaugle was the Valedictorian of the New Albany High School graduating class of 1989, and holds an Associates of Technical Studies in EMS & Fire Science from Columbus State Community College. 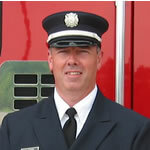 Kevin joined the department as a volunteer firefighter in the summer of 1990 while attending The Ohio State University. He was hired fulltime in January 1992, and received his Ohio Paramedic certification that same year from Columbus State Community College. Kevin was promoted to the rank of Lieutenant in December 1995, and promoted to the rank of Captain in August 2005. He was honored with the Firefighter of the Year award in 1999. Kevin is certified as a Fire Safety Inspector, Fire Investigator, and Fire Instructor, and EMS Continuing Education Instructor. Kevin is also an OPOTA certified law enforcement officer, and has been proudly serving as an Auxilliary Deputy Sheriff with the Franklin County Sheriff’s Office since June 1997. In his spare time, Kevin volunteers with the Gahanna Special Olympics group, where he helps coach the Bowling and Track & Field teams. Kevin resides in Reynoldsburg with his wife and 3 of his 4 children. Battalion Chief Brown is a 1988 graduate of the New Albany High School. He began volunteering with Plain Township Fire Department in 1988. In 1991 he received his paramedic certification from Franklin County Firefighters/Grant Medical Center and in June was hired as one of the first full-time firefighter/paramedics for the Plain Township Fire Department. In 1995 Joe was promoted to the rank of Lieutenant. In 2005 he was promoted to the rank of Captain. He serves as the EMS Coordinator/Public Safety EMS Instructor, holds certification for Fire Safety Inspector, and has recently graduated from the Ohio Fire Executive Program, which is conducted by the Ohio Fire Chiefs Association and the Ohio State University College of Business. BC Gregory Ecleberry has 21 years of fire service experience. BC Ecleberry served as a firefighter/paramedic for Newark Township(Newark OH) and Franklin Township(Columbus OH) prior to being hired by Plain Township in 1995. BC Ecleberry was promoted to Lieutenant in 2001 and Captain in 2005, and has served as the Plain Township fire training officer since 2001. BC Ecleberry is a fire service instructor of 16 years and teaches officer development and firefighter training at CTEC and served on the Ohio Fire Chiefs training and education committee. BC Ecleberry has an associate degree in Fire Science and EMS, a bachelor’s degree in public safety management, and is a graduate of the Ohio Fire Executive class 7. BC Ecleberry resides in New Albany with his wife Amy and two sons Andrew and Brandon. Captain Dudley is a Westerville North Graduate. He obtained his 200 hour firefighter card from the North West Career Center. 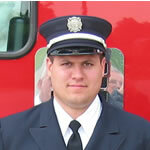 Travis is a Columbus State graduate with an Associates in Fire Science and paramedic certification. He began his fire service career at Genoa Township as a volunteer and has worked at Perry Township, Washington Township, Sharon Township and Plain Township. He joined the Plain Township Fire Department as a full-time firefighter in 1995 and holds certification as a Fire Safety Inspector. Captain Carney was born in Akron, Ohio. He graduated from Fairfield Career Center with a certificate in Automotive Mechanics. 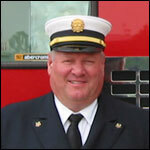 Jim began his fire service career in 1992 with the Violet Township Fire Department. 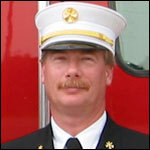 Jim completed the Franklin County Firefighters/Grant Medical Center Paramedic Education Program in 1994. He started with the Plain Township Fire Department in 1995. Jim is a hazardous materials technician, fire and bomb investigator, and Local Union President for the International Association of Firefighters Local 3850. 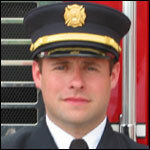 Jim also works as the Legislative Director for the Ohio Association of Professional Firefighters. He graduated from Harvard Law School’s Trade Union Program in February of 2005. Captain Myers has been a Plain Township resident since 1985 and graduated from Whitehall Yearling High School. Greg began his fire service as a volunteer with Plain Township in 1986. He received his paramedic certification from the Franklin County Firefighter/Grant Medical Center. Greg joined the department as a full-time firefighter in 1995. He has worked with West Licking and Basil Fire Department as a part-time firefighter and is currently a part-time firefighter with Jefferson Fire Department. He holds certification as a Fire Safety Inspector. Greg is a Plain Township resident. Lt Pabst resides in Gahanna Ohio with his wife and two children ages 7 and 4. He is a 1996 graduate of Northland High School. He obtained his firefighter certification from the Northwest Career Center in 1996 and his Paramedic certification from the Franklin County Firefighters Paramedic program at Grant Medical Center in 1999. Lt. Pabst began his fire service career here at Plain Township in July 1997 as a part-time firefighter and was hired full time in February 2001. In addition to Plain Township Lt Pabst has worked at Clinton Township as a firefighter/paramedic, St. Albans Township as a firefighter/paramedic, and Truro Township as a firefighter/paramedic. He is currently an adjunct fire instructor at Columbus State Community College. Lt Pabst is a fire instructor, rescue technician, member of the Central Ohio Strike Team, and fire investigator. In his free time he enjoys spending time with his family, traveling, fishing, hunting, and watching sports. Lieutenant Brian Reasoner graduated from Grandview High School in 1998. He went on to earn his Paramedic Certification and Firefighter Two Certification from Columbus State Community College as well as completing his certification as a Rescue Technician. 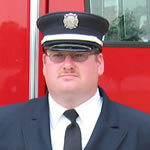 Brian began his career as a part time firefighter with Plain Township Fire Department in 2002. He also worked part time with Washington Township Fire until he became a full time Firefighter/Paramedic with Plain Township. Brian is also a Paramedic Preceptor instructor with Columbus State as well as a CPR instructor. Todd was born and raised in Johnstown, Ohio and graduated from Johnstown-Monroe High School in 1990. 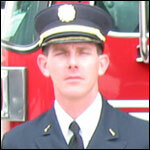 Todd started his firefighting career in 1992 with the Johnstown Volunteer Fire Department. He obtained his 200 Hour Professional Firefighter card in May of 1992 and his Paramedic card from Columbus Division of Fire in 1995. 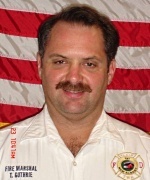 Todd went on to work full-time at the Jerome Township Fire Department from 1997 until 2001. Todd began his career at Plain Township Fire Department as a part-time firefighter in 1997 and began his full-time employment with the Department in 2001. Todd is a Certified Rescue Technician, Car Seat Technician, Fire Instructor, Fire Inspector and a member of the Central Ohio Strike Team, Region 4. Todd is also a Lead Instructor for the Fire and Emergency Services Exploring Program of Central Ohio which is a program that helps young people in the community learn and pursue their interest in the Fire and Emergency Service field. Todd has been married to his wife Liz for 14 years and they have two children, Makayla 10 and Dylan 1. In his spare time Todd enjoys watching sports, spending time with his family and vacationing in Myrtle Beach. Fire Marshal Terry Guthrie began his career in the fire service as a volunteer in rural Holmes County in September of 1990. His fire and EMS training has progressed from the volunteer levels to a career firefighter and paramedic. He has continued his education to include the state certified fire safety inspector, fire safety educator, advanced level fire investigator, fire/EMS instructor, and he holds an Associates Degree in Fire Science. He is constantly pursuing a higher level of education and is currently working towards completing the Ohio Fire Executive program through the Ohio Fire Chiefs organization. He was hired as a part-time employee at the Plain Township Fire Department in 2001 and was sworn in as a full-time firefighter/paramedic in December of 2003. July 16th, 2007 he started a new position as the Fire Marshal of Plain Township in New Albany, Ohio. His duties are primarily administrative and focus on the prevention of fires. Conducting fire/life safety inspections of new and existing businesses, determining fire origin and cause at fire scenes, participating in fire safety education for adults and children, and acting as an incident safety officer at emergency scenes adding an extra measure of security for the firefighters are essential job functions. Bicycling and riding ATVs’ are his favorite off duty activities as he takes advantage of many outdoor activities.